Busy mornings don’t mean you have to skip a good breakfast. 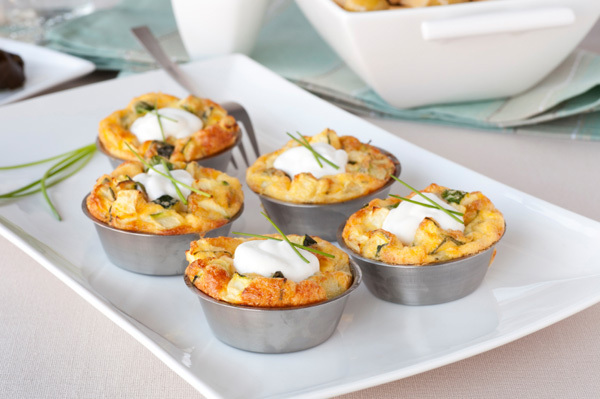 Make-ahead frittatas and stratas heat up in a flash, taste great hot or cold and travel well for on the go eating. Think of frittatas like a crustless quiche. While Spanish style frittatas (Spanish tortilla) contain potatoes and egg, Italian versions utilize leftover pasta. We’ve taken the liberty to sneak in a daily dose of veggies, cheese, sausage and fresh herbs to make a filling breakfast treat. The batter in this frittata recipe can be baked in a large saute pan or in muffin tins like we’ve done here, for an easy, pop-and-go breakfast. What’s the difference between an omelet and frittata? It’s the filling. Omelet fillings are folded in, while a frittata mixes it all up in one bowl. Use the frittata recipe below as a guide and add your favorite vegetables, meats and cheeses. In a medium saute pan, heat olive oil over medium heat until shimmering. Add potato, zucchini, onion and sausage. Cook four minutes, stirring occasionally, until onions are translucent. Remove from heat; let stand 10 minutes. Preheat oven to 350 degrees F. Meanwhile, in a medium bowl, whisk together eggs, milk and salt. Stir in vegetables. Divide mixture evenly between 24 buttered muffin tin cups. Sprinkle with cheese and chives. Place muffin pans in oven. Bake 16 to 18 minutes or until eggs reach 160 degrees F on an instant-read thermometer. Remove pan from oven; let stand 10 minutes before serving. Refrigerate, covered, up to five days. Stratas are much like bread pudding, but layered with ingredients and with more structure. Here we’ve taken classic French toast and baked it into a casserole for your morning maple syrup quick-fix. Preheat oven to 325 degrees F. In a large skillet, cook sausage over medium-high heat six minutes or until browned; set aside. In a large bowl, whisk together eggs, milk, sugar, vanilla, cinnamon, nutmeg and salt. Prepare a large baking dish with nonstick spray. Place a sheet of parchment paper on the bottom of baking dish; spray parchment paper with nonstick spray. Place half of the bread cubes in baking dish. Pour half the egg mixture over bread. Lightly press bread into egg mixture until saturated. Sprinkle crumbled sausage over bread mixture. Add remaining bread cubes. Pour remaining egg mixture over bread and lightly press. Cover with aluminum foil and let stand 30 minutes, refrigerated. Place baking dish on a foil-lined or Silpat-lined sheet pan. Place sheet pan in oven. Bake 35 to 40 minutes or until custard is set and internal temperature registers 160 degrees F on an instant read thermometer. Remove pan from oven; let stand 10 minutes. Serve with maple syrup.